Is it just me, or does pork seem like a fall/winter type meal? Bacon and ribs are normally served year round, but chops and tenderloin seem to be make more sense in the fall. Maybe it’s because we tend to serve apple sauce with our pork chops, or I’m just completely delusional and not making any sense right now, lol. 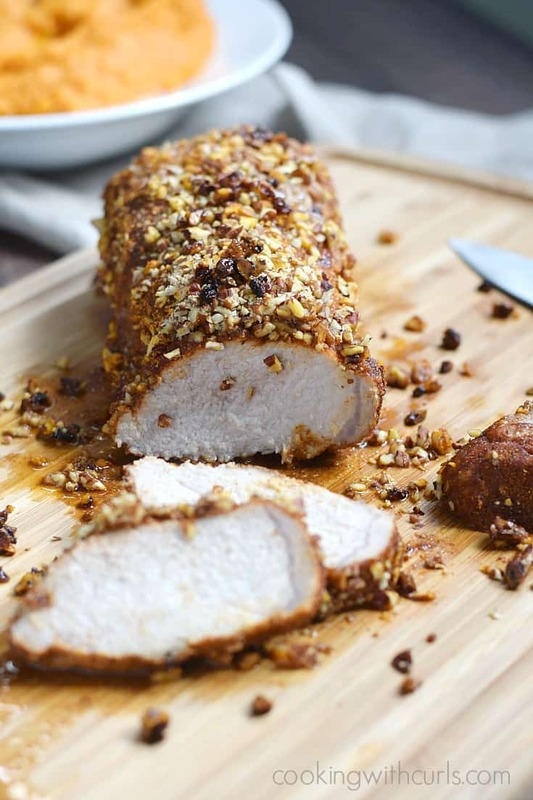 I guarantee that your family will enjoy this Pecan-Crusted Pork Tenderloin anytime of the year…..
even though I didn’t think to make it until now…during the fall. 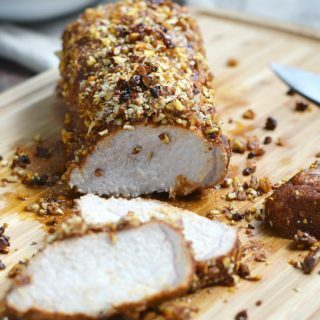 😉 I gave my Pecan-Crusted Pork Tenderloin a slight southwest flair, but it pairs nicely with Mashed Sweet Potatoes, Crispy Roast Potatoes, or even a big side of salad….depending on your dietary preferences. Preheat oven to 375 degrees. Remove excess fat/outer skin from pork tenderloin, if necessary. Place on paper towels and pat dry. Set aside….. 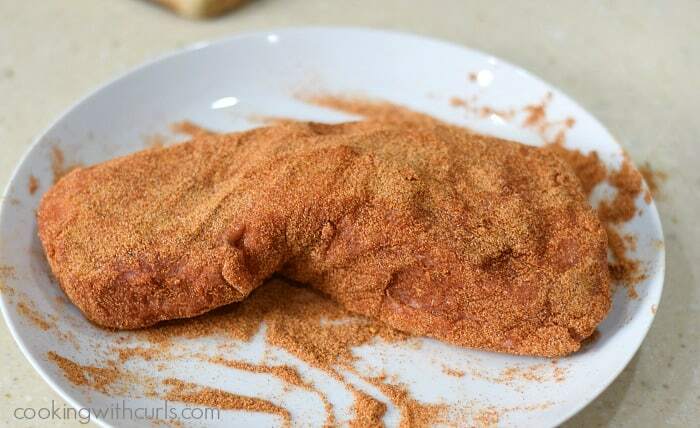 Mix seasonings together in a small bowl, then rub evenly over pork….. Finely chop pecans by hand, or in a food processor. 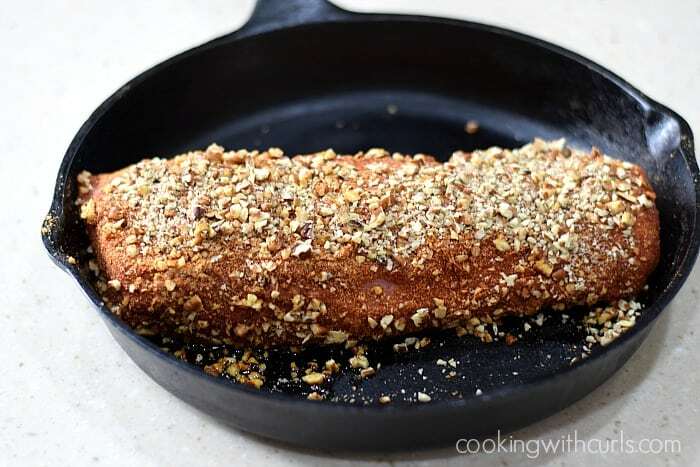 Evenly coat pork with the pecans and place on a baking sheet on cast iron skillet…..
Roast for 25 to 30 minutes, until internal temperature reaches 145 degrees. Remove from oven and allow to rest for 10 minutes before slicing. Slice pork into 1/2-inch thick medallions and serve…..
Pork tenderloin is the leanest and most tender cut of pork, but it turns tough very quickly if over cooked. Use your thermometer to get an accurate measure for how done it is, not just the time on the clock. There is no “glue” to hold the chopped pecans on the sides of the pork. Don’t stress out, just get it as well coated as you can. How do you serve your pork tenderloin/chops? 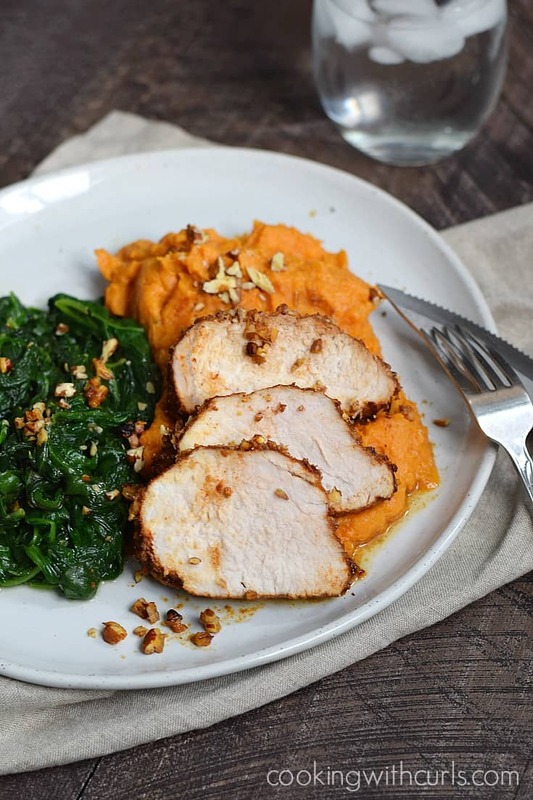 Jazz up your dinner with this tender and delicious Pecan-Crusted Pork Tenderloin served with Mashed Sweet Potatoes and your choice of vegetable. 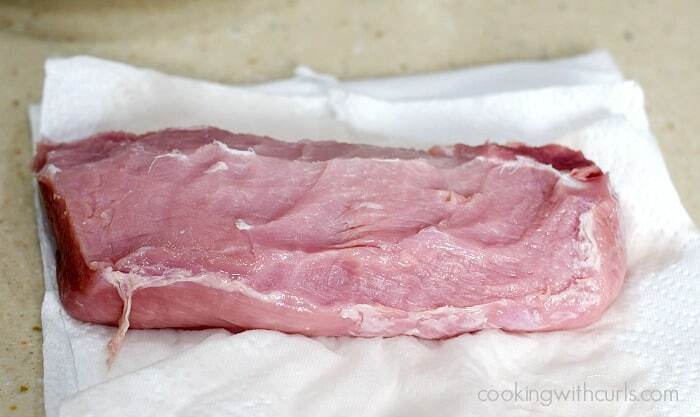 Remove excess fat/outer skin from pork tenderloin, if necessary. Place on paper towels and pat dry. Set aside. Mix seasonings together in a small bowl, then rub evenly over pork. Finely chop pecans by hand, or in a food processor. Evenly coat pork with the pecans and place on a baking sheet on cast iron skillet. Roast for 25 to 30 minutes, until internal temperature reaches 145 degrees. Remove from oven and allow to rest for 10 minutes before slicing. Slice pork into 1/2-inch medallions and serve. Oh, how I wish I lived with someone who wasn’t allergic to nuts! Looks amazing!